What was the artistic brief? Several highly enjoyable and creative meetings at King’s Cross Station with the Gresley Society Trust formed the basis of the brief. We were inspired by the location. Sir Nigel Gresley was Chief Mechanical Engineer for London & North Eastern Railway (LNER) between 1923 and 1941 and had his offices at King’s Cross station. A shared vision emerged. We wanted a larger-than-life sculpture of Sir Nigel Gresley, with his old building as a backdrop, representing the past, with him looking out to the new concourse, and to the future. There were still so many more questions to answer. At what age should he be depicted? What pose would be appropriate? What should he be wearing? It was time for me to get stuck into researching the man, his life and his engines. And time for closer scrutiny of the proposed location, camera at the ready. 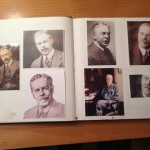 My collection of pictures grew – here are a few pages of my ‘working’ book, which I use throughout a commission. Further discussions ensued and I was commissioned to sculpt three maquettes (or small models) to help make the final decision on the pose.